Ian McCormick is one of the new generation of Canadian farmers. Thanks to programs like FarmStart and CRAFT (Canadian Regional Alliance for Farmer Training), new farmers — young people and folks who often didn’t grow up farming — are trying their hand at small-scale production. FarmStart helps develop a new generation of farmers by leasing small parcels of land and facilitating training. CRAFT is a well-developed network of Ontario organic farms that offer comprehensive internships to aspiring farmers. 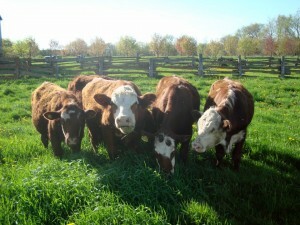 McCormick has been raising grass-fed beef cattle for just three seasons in southern Ontario, and is now looking after a small herd of 18 cattle that he keeps on host farms. He’s also finishing a Masters of Science at the University of Guelph, having completed a BSc in Environmental Biology at Queen’s. He’s 26. Would he like to be a full-time farmer? Well, yes, but he explains “that’s a hard reality to achieve in your twenties unless you are born into it or win the lottery.” In the meantime, McCormick is going to finish up his masters in soil science and keep working as the start-up farm coordinator at FarmStart until he can meet his 10-year goal of working as a full-time, self-sustaining farmer. Recent news suggests that the XL plant is set to reopen Monday, under the new management of Brazilian-based JBS USA and under the watchful eye of the Canadian Food Inspection Agency. Fully 2,000 employees were laid off in September and it is unclear how many will be rehired. Tragically, in one load 500 to 600 tonnes of beef — wasted animal lives — were sent to a local landfill as a result of the recall, with more to come.